oyager 1, having completed its spectacular photo safari of our solar system, has one more destination in store. But don’t bother waiting around. Speeding across the lonely interstellar void at 38,000 miles per hour, NASA’s fastest probe isn’t due to approach AC+79 3888—a nearby star—for about 40,000 years. Those seeking to travel far beyond Earth face many complex challenges, though according to John Brophy (ME ’78), the most formidable hurdle is easily defined: “Space is big,” he says. Even as stargazers today enjoy an up-close and personal view of the cosmos, thanks to remarkable ground- and space-based instruments, the prospect of ever visiting a star beyond our solar system still seems impossibly remote. The nearest candidate, Proxima Centauri, winks at us from nearly 25-trillion miles away. Even modest journeys within our solar system present daunting challenges, due to the distances involved. Brophy is approaching the problem of the enormity of space by designing advanced propulsion systems to carry probes similar to Voyager, and perhaps one day human expeditions, over greater distances with unprecedented speed. He began working on advanced technologies known as ion propulsion systems at Colorado State University, where he completed his Ph.D. in 1984. 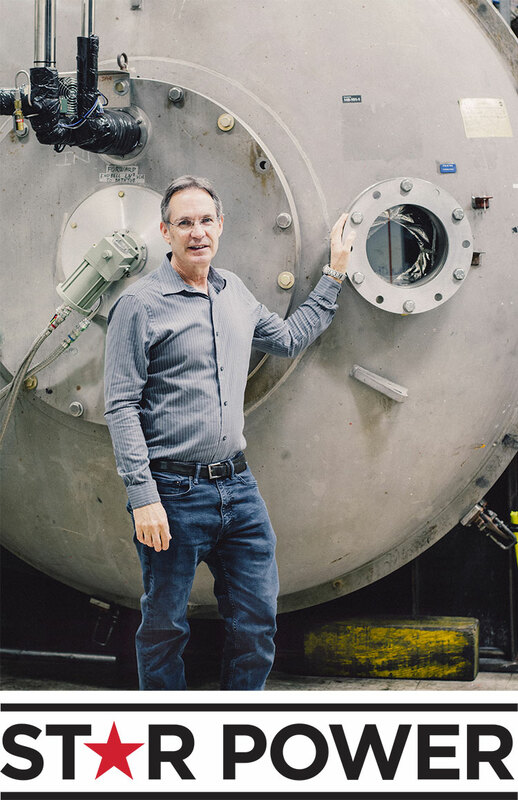 Since 1985 he has been an engineer in electric propulsion technology development for the Jet Propulsion Laboratory (JPL), in Pasadena, California, where he is now an engineering fellow. As Brophy explains, one of the primary limitations of earlier spacecraft, such as the Saturn V/Apollo 11 vehicle, which carried astronauts to the moon, is the enormous weight of the chemical fuel that has to be carried aboard such rockets. This approach is simply too heavy, ungainly, and inefficient for fast, long-range voyages. To propel the spacecraft forward, rockets spew gas from their engine nozzles at high velocity. A formula based on the conservation of momentum says that the desired spacecraft velocity and the rate at which exhaust comes out of the rocket engine govern the amount of propellant needed. Known as the rocket equation, this principle places severe upper limits on the practicality of conventional spaceflight over large distances. “The solution is to decouple the propellant from the source of energy used to accelerate it,” Brophy says. These advanced systems, known as ion propulsion, gather energy from the sun using onboard solar panels to convert this radiant energy into electricity to run the ion thrusters. Rather than burning a chemical propellant as in conventional rockets, ion propulsion creates thrust by producing and accelerating a beam of charged particles, or ions, with electricity. The technique creates very high exhaust velocities on the order of 40,000 meters per second. “That is about 10 times faster than the best chemical rocket engine,” Brophy says. Brophy helped implement the idea of ion propulsion on NASA’s Deep Space 1 mission, which performed a successful flyby of the asteroid Braille and then the comet Borrelly. He later designed the ion propulsion system for the ambitious DAWN project to rendezvous with protoplanet Vesta and dwarf planet Ceres. In 2015 Brophy was part of the Dawn team that received the Robert J. Collier Trophy from the National Aeronautic Association for his ion propulsion system on NASA’s Dawn mission. Still, as Brophy notes, existing ion propulsion systems have their limitations for long-distance travel. Gaining additional power for the ion thrusters requires larger onboard solar arrays that add to the craft’s weight and reduce its speed. The radical solution proposed is to replace the sun as the external power source with a massive, space-based array of high-intensity lasers, spread over 1 to 3 kilometers, beaming light energy to the spacecraft across astronomical distances and providing around 100 megawatts of power to the spacecraft. The spacecraft would carry photovoltaic cells specifically tuned to the frequency of impending laser light and convert this power to electricity. Such technology would permit travel to an exotic locale known as the solar gravity lens focus location, a region of space that begins about 550 astronomical units (AU) from Earth. (1 AU is the distance from Earth to the sun.) Here, the sun’s gravitational field can be used like a gigantic magnifying glass, permitting spectacular imaging of distant planets. Controlled propulsion at such a pace—around 400,000 to 500,000 mph—would potentially open up a range of other enticing possibilities, including human missions to Mars and Jupiter, robotic orbiter missions to Pluto, asteroid mining operations, and the ability to deflect nearby asteroids from a catastrophic collision with Earth.